Located at the foot of the Vitosha Mountain in the Sofia suburb of Boyana, the church's unique murals will come back to display next Monday. Even nowadays experts and historians, more than seven centuries later, still stay stun with their beauty, expressiveness and deep humanness. 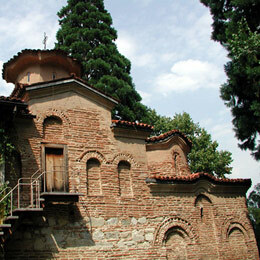 Perched on the outskirts of Sofia, the little church is hidden in a lovely park. When I last visited years ago, I had to wait there some time before I was able to buy a ticket, and later before I was allowed to get into it (because of its small size, only small groups can go in at the same time). The inside of the church is the reason to go here. All its walls are covered with frescoes. Dark blue is the main colour, and the paintings are now in good repair. Boyana Church consists of three buildings. The eastern church was built in the 10th century, then enlarged at the beginning of the 13th century by Sebastocrator Kaloyan, who ordered a second two-storey building to be erected next to it. The frescoes in this second church, painted in 1259, make it one of the most important collections of medieval paintings. The ensemble is completed by a third church, built at the beginning of the 19th century. This site is one of the most complete and perfectly preserved monuments of east European medieval art. Besides the first layer of 11th-12th century frescoes, of which only fragments are preserved, and the famous second layer of murals from 1259, the church also has a smaller number of later frescoes from the 14th and 16th-17th century, as well as from 1882. During the Middle Ages the strong Bulgarian fortress of Boyana (Batil) stood on the lower slopes of Mount Vitosha in what is now the Sofia suburb of Boyana. This name is mentioned for the firs time in 969. Boyana was one of the thirty-five fortresses and settlements, which formed the fortification systems of the city of Sredets (Sofia). The Boyana Church was build within the fortress and is a magnificent example of medieval architecture and monumental art. The church owes its world fame to the frescoes from 1259. They form a second layer over the paintings from the earlier centuries. In all, there are 240 depictions on the walls. Its painter is still anonymous, but stands for the team that decorated the church and that was trained in the studios of the Turnove Art School. A total of 18 scenes in the narthex depict the Life of St. Nicholas. The painter here drew certain aspects of contemporary lifestyle. In The Miracle at Sea the ship and the sailor's hats recall the Venetian fleet. Saints and martyrs feature the main frescoes, but the unknown master has also painted the full-size portraits of the donors (ktitors) - Kaloyan and Desislava - and the royal Bulgarian couple King Constantine Tich and Queen Irina. Kaloyan holds a model of the church and presents it to St. Nicholas. These genuine masterpieces of 13th century painting, created 200 years before the European Renaissance mark a remarkable peak in Eastern Christian Art. The monument was added to the UNESCO World Heritage List in 1979. The frescoes were restored and cleaned in 1912-1915 by an Austrian and a Bulgarian specialist, as well in 1934 and 1944. The church was closed for the public in 1977 in order to be conservated and restored and once again opened in 2000. On Monday, in the presence of President Georgi Parvanov and Sofia Mayor Boyko Borisov the restored frescoes on the eastern part of the Boyana Church will reveal their original beauty to visitors.